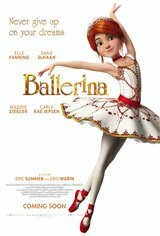 An orphan girl (Elle Fanning) has big dreams of becoming a ballerina. Her friend Victor (Dane DeHaan) decides to help her run away from the small town where they live in order to get her into a ballet school in Paris. Although she has no formal training, she gets a position as a pupil at the prestigious school. It soon becomes clear that she has a lot of work to do in order to keep up with the other students, who've been training for years. She will dance off against her rival ballerina Camille (Maddie Ziegler), for a coveted part in the ballet recital.